A day after environmentalist GD Agarwal, better known as Swami Gyan Swaroop Sanand, was evicted from Maitri Sadan, Haridwar, where he was on an indefinite hunger strike for the cause of clean Ganga, the Uttarakhand High Court on Wednesday directed the state government to disclose his location, shift him to AIIMS Rishikesh and hold parleys with him on the issue in complete bonhomie within 12 hours. The 86-year-old Swami Gyan Swaroop, a professor at IIT, was evicted from Maitri Sadan by the police on Tuesday and shifted to an undisclosed location after he refused to end his fast. The Chief Secretary to the State of Uttarakhand is requested to hold parleys with the petitioner to address the sensitive/delicate issue raised by him in complete bonhomie within 12 hours. The Principal Secretary, Home to the State of Uttarakhand, is directed to disclose the identity of the place where the petitioner has been kept, to his disciples/followers forthwith by contacting them. The district administration is directed to shift the petitioner to AIIMS at Rishikesh for medical examination forthwith. In case the petitioner is found medically fit, he would be escorted back to Maitri Sadan. 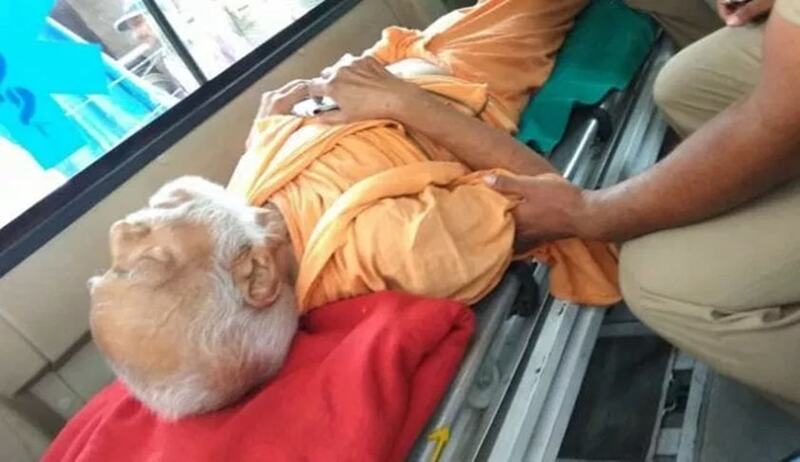 However, if the petitioner’s health has deteriorated, he shall be admitted in AIIMS, Rishikesh, and his disciples/followers will be permitted to look after him. It shall be the responsibility of the Principal Secretary, Home, to protect the life of the petitioner. The state government shall provide all the medical facilities to the petitioner under the supervision of Director, AIIMS, Rishikesh. Swami had been raising his voice for the preservation of Ganga for years now with fasts and protests. He has also raised his voice against the construction of power projects on holy river Ganga. The construction of four hydroelectricity projects on the rivers Bhagirathi, Palmanery, Lohari Nagpal and Bhaironghati was shelved. Swami was on fast since June 22 at Maitri Sadan for the cause of Ganga. He was picked up on July 10 and the entire incident was recorded on CCTV cameras and photographs were taken on the spot. The court noted that the petitioner was served with a notice by the district administration to end the fast but he did not as he was hale and hearty and there was no imminent threat to his life. “This act is an arbitrary exercise of the police power. Every citizen has a right to protest subject to just restrictions imposed by the state government in larger public interest. “Petitioner’s disciples were required to be informed before removing him forcibly from the spot. His disciples and followers were kept in dark. He is espousing the cause of river Ganga in a peaceful manner. He has earlier raised his voice for preserving the sanctity of holy river Ganga. Petitioner has a right to maintain his dignity and honour. He has a right to maintain his conviction,” noted the court. Observing that “persons like the petitioner are the conscience keepers of the society and their conviction is to be respected and valued,” the court said, “Life of the petitioner is precious and is required to be protected/preserved by the State functionaries. Rule of law must prevail at any cost”.